Hamilton’s Synergy Show Choirs celebrates successful season with April 6 concert - Hamilton School District. 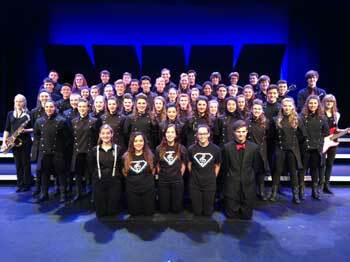 The Hamilton High School Synergy Show Choir will celebrate its successful season with a final home concert April 6 for family, friends and community members. The concert, which will cost $5 in advance and $6 at the door, begins at 7 p.m. in the Hamilton Fine Arts Center (HFAC). Children under age five are free. Advance tickets can be purchased at the HFAC box office, HFAC online or from choir members. The “Pop Show” will also feature the Hamilton A Cappella Choir and many talented students in solo and small group acts, performing rock, indie, Broadway show tunes and other pop music. The theme of this year’s show is “You Can’t Steal My Rock and Roll.” It will showcase more than 60 of the high school’s best singers. Feb. 27 – In the Spotlight Competition – first runner-up in class A division.